A young singer on a train bound for London finds herself among a group of famous musicians and performers. At Kimberley Prescott's villa, a stranger shows-up and claims he is her brother who supposedly died the previous year in a car accident. "The Nun's Story", in which he played a Belgian doctor working in the Congo, provided Peter Finch with one of his best-known roles. 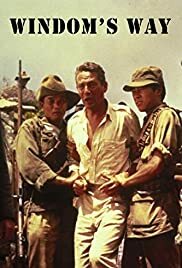 Two years earlier, however, Finch had also starred in a much less well-known film in which he also played a European doctor working in a Third World country, in this case Malaya (as it then was), shortly after independence. There are two main strands to the plot. One concerns the efforts of Finch's character, Dr Alec Windom, to mediate in the dispute between the local Malay rubber-tappers and their employers, a British company. The dispute has arisen out of the tappers' wish to grow their own rice, something which the company (who regard rice as their own monopoly) object to. Windom's instincts are to sympathise with the tappers, especially as the local company manager, Patterson refuses to entertain any idea of compromise and has no compunction about calling in the local police, whose methods of upholding law and order can be brutal, to deal with any unrest. Things become more complicated, however, when some of the workers defect to a local guerrilla group who are in revolt against the government. An additional complication arises from the fact that one of the guerrillas is the brother of Windom's chief nurse. The guerrillas are clearly based upon the Malayan communists who fought both the British colonial regime and then the independent Malayan government. The word "communist", however, is never used- they are simply referred to as "rebels"- possibly because the real Malayan communists were dominated by ethnic Chinese and attracted little support from ethnic Malays. The other strand deals with relations between Windom and his wife Lee. The two are estranged, but at the beginning of the film she has unexpectedly turned up in Malaya hoping for a reconciliation. We do not see anything of their life together in Britain, but from what we hear it would appear that one of the causes of their estrangement was Lee's attempts to interfere with her husband's career and her insistence that he should apply for what she was as socially prestigious positions. There is an implication that Windom moved to Malaya after the breakdown of his marriage precisely because he believed- obviously incorrectly- that Lee would not attempt to follow him there. "Windom's Way" was made by the well-known director Ronald Neame, later to be responsible for films like "The Chalk Garden" and "The Prime of Miss Jean Brodie". I would not rank it quite as highly as either of those films, and in terms of quality it is in nothing like the same class as "The Nun's Story", but then that would perhaps be an unfair comparison as, despite the presence of Finch in similar roles, they are quite different in style and purpose. Here, Windom is the main character whereas Finch's character in "The Nun's Story", although important, is a supporting role who only appears in the second of the film's three acts. The main concentration in that film is on the spiritual development of Audrey Hepburn's character Gabrielle.